Venezia Manuel is putting rubber bands around white T-shirts, while observing the ballet moves of a group of six to eight-year-old students enrolled in the Southern Illinois University Edwardsville East St. Louis Center (ESLC) Performing Arts Summer Program. In another studio, TaShayla Montgomery is showing dance steps she choreographed to a group of 13-17 year olds. While in another room, Gerald Babatudne Sylla Williams is teaching African drumming and dance, after taking a break from sewing costumes for more than 80 students. And in one of the performing arts’ offices, Arturo Miller is downloading one of his dance videos to share with his class of students. These four instructors are alumni of the ESLC for the Performing Arts program. They are committed to passing along their expertise and fervor, especially to those enrolled in the program that was instrumental in developing and shaping their talents. For the past five weeks, the dance instructors have been teaching their students in preparation for the end of the summer concert, The Art of Music and Dance II, which will be held at 6 p.m. Friday, July 29 in the Multipurpose Room in Building D at the East St. Louis Higher Education Campus. The SIUE East St. Louis Center for Performing Arts program director is Jack Williams. The 22-year-old Manuel, who graduated in 2016 from the University of Iowa with a bachelor’s of fine arts in dance and education, said she came to the East St. Louis Center for Performing Arts at the age of seven. Manuel is working on becoming a certified Dunham Technique instructor. She plans to audition for numerous companies with a range of styles. Later, Montgomery said she and her sister, JayKayla Winford, signed up for the upcoming program session. The 21-year-old will graduate from Howard University in 2017 with a bachelor’s in theater arts and an emphasis in dance. Montgomery has already been offered to be an apprentice in a professional dance company. She also plans to audition for Broadway, The Rockettes and contemporary ballet companies. She also intends to pursue a master’s in psychology and teach dance therapy. Arturo Miller got involved with the ESLC performing arts program by the way of music, although he’s always had a passion for hip-hop dancing. As a student at the SIUE East St. Louis Charter High School, Miller took a music class with E.L. Wilkes from 2009-2010. “I wanted to play the guitar, but didn’t think I could do it,” Miller said. “But Mr. Wilkes encouraged me. I kept at it and got good. That gave me my first look into what I could do if I put my mind to it. Miller is based in Los Angeles, where he is pursuing his dancing goals. His motto is “Stay focused and keep God first.” He also plans to operate his own company, the Art of Dance. Gerald Williams is the oldest performing arts alumni currently working with students, having come to the program in 1987 at the age of 17. Williams, now a master African drum musician and dancer, began learning the fundamentals at the ESLC when the program was initially called the Katherine Dunham Center for the Performing Arts. Williams now operates Kumasi Kambeng, which means First Unity. The dance company, based in Venice, teaches West African drumming and dance for all ages and currently has approximately 30 participants. The ESLC’s performing arts program was started by legendary dancer, anthropologist and social activist. Katherine Dunham. The program is now offered in the summer and provides educational and cultural enrichment for the surrounding community. Alumni from the SIUE East St. Louis Center Performing Arts program were instructors for summer classes. 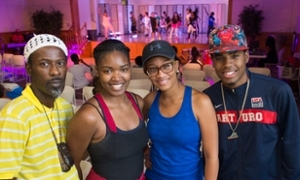 L-R: Gerald Babatudne Sylla Willams, TaShayla Montgomery, Venezia Manuel and Arturo Miller. Students rehearse for the summer concert on Friday, July 29.